LOS ANGELES, March 20, 2019 /PRNewswire/ -- Unless you were fortunate enough to be born a psychic or telepath, you most likely rely on surveys or other methods to gather information on what your customers want from your business. And if you don't, you should. 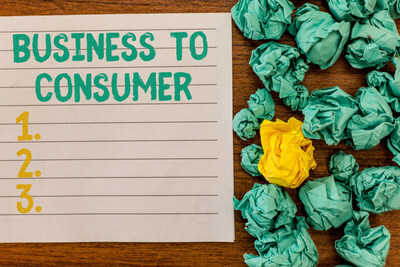 The reason being, out of a sample group of 1200 customers and 400 retail executives, there was a large disconnect between what the customers desired and what the retail executives were providing. This disconnect was prominent in nearly all aspects, from in-store experience, online shopping, social media, and much more. In short, a large customer disconnect could equate to a large loss of profits, particularly in the realm of the in-store shopping experience. Seventy percent of customers want a more streamlined in-store experience, which comes in the form of convenient store layouts and minimal interaction with sales associates. Ironically, only a mere 46% of customers are in favor of more staff interacting with them compared to a whopping 80% of retail execs. Perhaps the reason lies in the different types of shoppers. Very simply put, there are the ones that need help and the ones that want to be left alone. Shoppers that can be classified as more informed, practical, 'just browsing', or brand-loyal, generally don't care for much help. The shoppers that are indecisive, impulsive, or social, that's where a sales associate's interpersonal skills shine. However, no matter which shoppers come into your store, they will all want a simple store layout that is easy to navigate, either on their own or with help. Another improvement customers want to see in the in-store experience is more utilization of technology, like self-checkout kiosks, mobile payment, and even virtual-reality try-ons. In relation to the online shopping experience customers favor a more personalized approach. When it comes to the online experience, customers crave personalization, meaning they want to see more targeted content. While efficiency and speed appear to be at the core of these customer requests for the in-store experience, customization is number one for the online shopping experience. So much so that nearly two-thirds of millennials are even willing to pay for such customization. Unfortunately, big retail execs are channeling their energy into the wrong areas, like social media and chatbots when they think of what will make a technological impact. While a combined total of 76% of customers wanted technology like self-checkout kiosks, only a meager 5% wanted to see more use of chatbots and 12% wanted more active social media accounts from brands. So what are retailers to do? For starters, don't rely only on their own insights, because they are wrong a majority of the time. From the data collected, there is a prominent trend in a simplified shopping experience rather than extravagant. In a perfect world, customers essentially want to walk in, find exactly what they want, pay, then exit and enjoy their purchase. Their online experience shouldn't deviate too far from this either. Retailers' mission should be to execute methods that achieve this scenario as much as possible, to encourage more traffic to their stores, thus increasing sales. And how does this parallel to the affiliate world you ask? Well, we just so happen to have that answer. Over the last six years, advancements in shopping technology have bled into various online customer acquisition channels, from RTB platforms to PPC bidding automation, and more. In the affiliate space, publishers have been keeping up with the demand for shopping technology by building and enhancing toolbar and remarketing technology. Our Director of Accounts, Kyle Mitnick, notes: "To be candid, a large percent of affiliate-driven technologies have been fueled by bottom of funnel attribution tactics, leading to limited use, and in some cases, advertiser and network bans. However, there have been exceptional top of funnel technologies from content platform affiliates, that not only engage demographic filters to customize shopping experiences but also utilize algorithmic predictive pairing for ease of product selection. The outcome has been a pleasant, relevant shopping experience for the user, and increased conversion rate and bottom line for the advertiser." For more about Advertise Purple and our award winning affiliate strategies, please contact sales@advertisepurple.com. Advertise Purple is a global digital marketing agency focusing on the growth & optimization of the affiliate channel. In 2018, Advertise Purple earned the prestigious titles of Inc.'s "#49th Top Advertising & Marketing Company in the United States", "451st Fastest Growing Private Company in the America", and #1 Fastest Growing Affiliate Marketing Agency in the United States. To learn more about our service, please visit https://www.advertisepurple.com/.